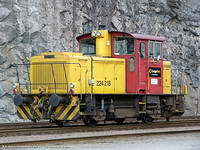 This is the place for watching and investigating Norwegian rolling stock on railways, suburban lines, metros and trams. This web site consists of numerous user uploaded pictures, mostly modern, and some historical pictures as well. On most of the presented stock, there are information on when built, where used, withdrawn etc., way back to the beginning of rail transportation in Norway. The lists of locomotives and railway motor units are nearly completed in this manner; less so on passenger cars, trams and metros. So far almost none freight cars are implemented in the database, but this will come.